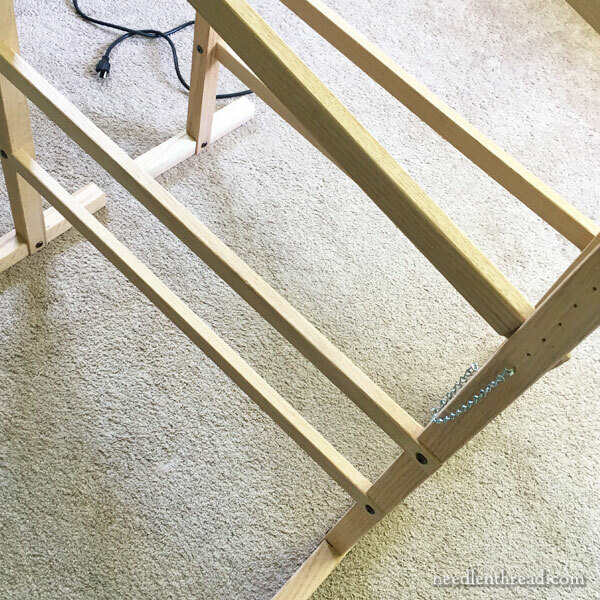 First Things First – My Embroidery Trestles are Up & Ready! I mentioned last week that I’m moving Needle ‘n Thread into a new space. I can officially call it a “studio,” I suppose, because that’s where I’ll work, design, stitch, mail things from, and (tentatively) offer some small classes and the like. I’m very excited about it! Once I get things situated, I’ll take you on a little tour of the apartment (flat) that’s half of a duplex that I’ve rented. I’ll tell you the whole story of why I ended up going with a residential space despite my deepest dreams and desires of setting up shop in our pretty historical downtown district, discuss the obstacles, the pros and cons of the set-up, and give you some before and after photos of the simplest and affordable cosmetic changes I’m making to the space. Perhaps if you’re considering expanding a space – maybe you have a small home needlework business, too? – it might give you some ideas. While I haven’t started transporting the daily essentials to the place (I start that today), I did take advantage of all the empty space to assemble my trestles. Yes, I will Finally have a Dedicated Trestle Space! I want to show them to you and give you some information on where you can find them in the States. The advantage of a slate frame with any embroidery project – but especially a long-term embroidery project – is that you can achieve drum-taut tension with it, and adjust it as need be while your project is underway. I use slate frames (or similar off-shoots) for ecclesiastical embroidery projects that will be on the frame for a while. The trestles are made by K & A Embroidery Supplies. 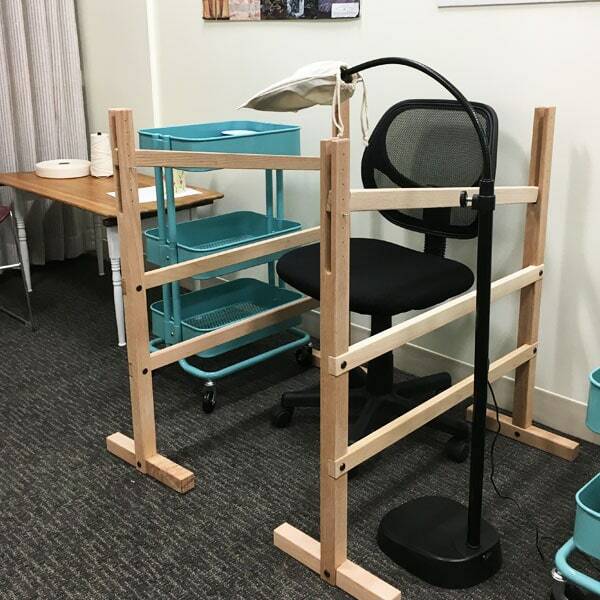 They supply the trestles for the San Francisco School of Needlework and Design, and for those who have found trestles through Lucy Barter (who teaches there), you will recognize these as the trestles that her husband makes. They’ve gone into full production as a small business, and you can find their website (just gone live!) here. With the way the trestles above are situated, you would sit in the chair, put your larger frame in front of you on the right and left bars of the trestles, and then stitch away! The large embroidery frame would be unattached to the trestles, and if you need to access the back, you just flip the frame. If you need to leave you workstation, you move the frame out of the way. Simple! The K&A trestles are made from solid oak. They don’t have a finish on them, but are sanded smooth. All the parts fit together perfectly, and, thanks to the simplicity of the whole trestle concept, they’re very easy to assemble. I timed the assembly process, in fact. 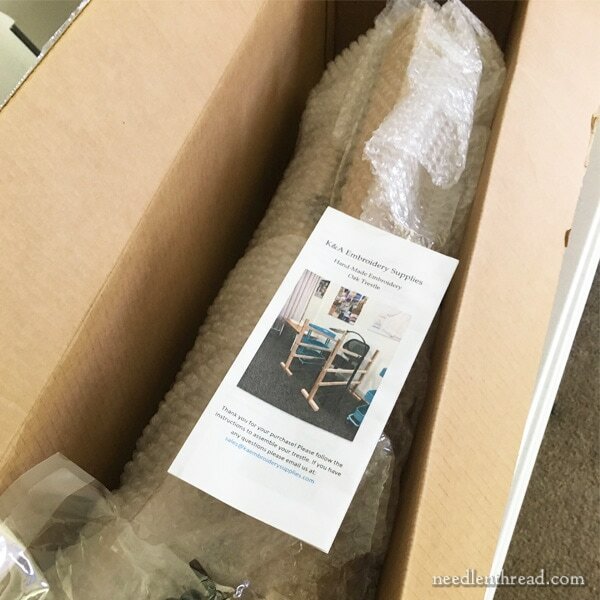 It took me just under 18 minutes to assemble the set, from opening the box and unwrapping the pieces from all the bubble wrap to the finished trestles. They’re pretty intuitive when it comes to putting them together, but there is a nice little instructional flyer enclosed with the parts, in case you need it. The whole process involves using an Allen wrench or hex key (included) to screw in 12 bolts. The little chain you see attached to each leg of the trestle holds a cotter pin, which is used to hold the top bar into position. I like the fact that it’s attached with a chain to the set – you can’t lose it! And I like the fact that it’s a simple cotter pin and not a custom made wood peg of some sort, because …well, if you did lose it somehow, cotter pins are easy to replace. The disadvantage of trestles is that, when they are set up, they require a large footprint, so if you have limited space, that’s definitely a consideration. They also can’t be used while you’re sitting in a sofa, easy chair, or recliner. They require a task chair or stool, or a kitchen chair or the like. But the advantages? Well, these will last you a life time. They’re easy to set up. They can easily be moved relatively flat against a wall and out of the way. They are the ideal solution for large frames. They’re nice looking, very sturdy, and they work great on carpet or hard floors. The trestles from K & A Embroidery Supplies are available through their website here. If you want information about them – maybe you want to place a group order for a teaching studio or something? – there’s a contact email at the end of their home page. 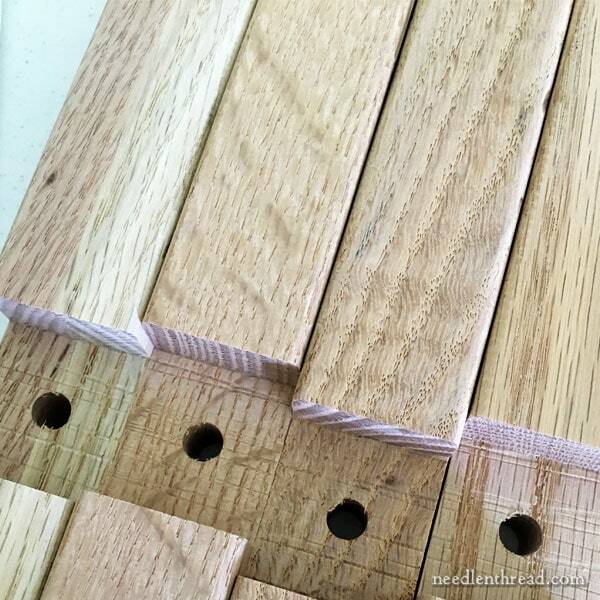 They are solid oak sanded smooth, no finish. The measure about 32″ long with 10″ feet, and are height adjustable from around 28-36″. All the hardware and tools necessary to assemble are included in the box. The trestles are $375 a pair, and US shipping & handling is $65. 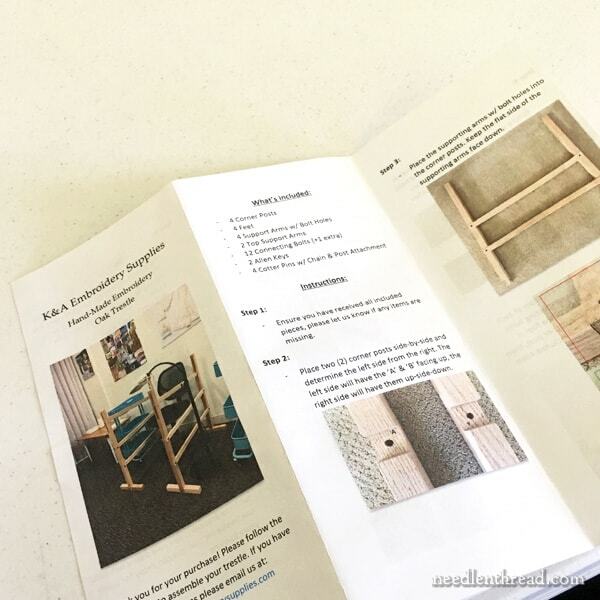 Thanks to Andrew at K & A Embroidery supplies for contacting me about the trestles in the first place and for sending along the set. I’m very excited to have them as a permanent part of my new workspace! Congratulations and I’m so glad you have found a new work space at last and I hope it will be the right space for you. I can’t wait to see the photos of your new work space and what you plans you have for it. I’m glad it’s big enough to hold your trestles and other large embroidery items as well as all your books etc. Thanks for sharing the news of your new work space with us and I do hope you will be happy there. So, they’re like sawhorses for embroidery? 😉 Very cool to see this set up! I like that you can customize the angle of the top bar–very smart. I can’t wait to see more as you optimize your space for your projects! Nice, but $375? Sadly, the cost of this hobby has gotten progressively out of hand. It’s no wonder needlework is dropping in popularity. Hi, Sali – yes, they’re a bit pricey, but for folks who do large projects that take a long time, and for whom needlework is a major part of their lives, they’re worth the investment. But you’re right – embroidery can be very expensive. On the other hand, it’s also one of those arts and crafts that can be done on a shoestring budget, using a basic hoop or even working in hand. It really depends on what the stitcher does and how much time and energy they put into stitching, whether or not something like this is worth investing in. For those who need them, it’s good to know that these supplies are available. You’re certainly right that needle work can be a very expensive hobby. But like any other activity, it can be enjoyed in many different ways. For someone like Mary, for whom needlework is her passion & profession, it makes sense to invest in high quality, costly equipment. For me, chain and local shops & an occasional internet splurge do the trick. Each of us can get joy from our hobbies in ways that make sense in our circumstances. Congratulations on your business growth, Mary! Looks like a very nice spot. I can’t wait to hear all about it – don’t leave anything out! I am excited for you! Good luck! I am so happy for you that you’ve found a studio space! And I can’t wait to read the whole story about it. I am very lucky that I was able to use the former livingroom with its 26 square metres as my studio and classroom. We have an almost equally large kitchen, so that’s where we socialise. Good luck with moving your stuff! And what will you use your garage for once you have moved? I am glad to hear you may be offering classes. Looking forward to finding out more about that. And congrats on the new space. That trestle table looks wonderful! As a hobby stitcher it would be a luxury I couldn’t justify, but for a professional embroiderer like you I can see it making stitching large projects so much more manageable. And the price? Yes, it’s a large outlay, but it’s negligible costed over the lifetime of use you expect to get from it. I have had these trestles for several months and LOVE them. They are so easy to assemble. When not in use I take the feet off and store them in the back of a closet.